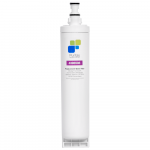 The Puritas PUR-00 water filter is used in refrigerators by Whirlpool, Kenmore, Maytag, KitchenAid, Amana, Jenn-Air and others. Most commonly known as part number 4396508 - the PUR-00 installs easily in your refrigerator by via a simple twist. Advanced carbon block technology insures great tasting water and ice cubes.